Anyone knows Dave Grohl will stop at nothing to deliver for his fans, from continuing a concert after breaking his leg to performing private shows in fans’ garages. But there are some things the nicest guy in rock can’t control, and sadly, Dave is walking away from his career today: The Foo Fighters are breaking up after Dave Grohl’s parents signed him up for extra math tutoring at Kumon. Wow. Who knew the final chapter would come so soon. This is a major blow to alternative rock, but the band said in a public statement that Mr. and Mrs. Grohl warned them that this was a long time coming. 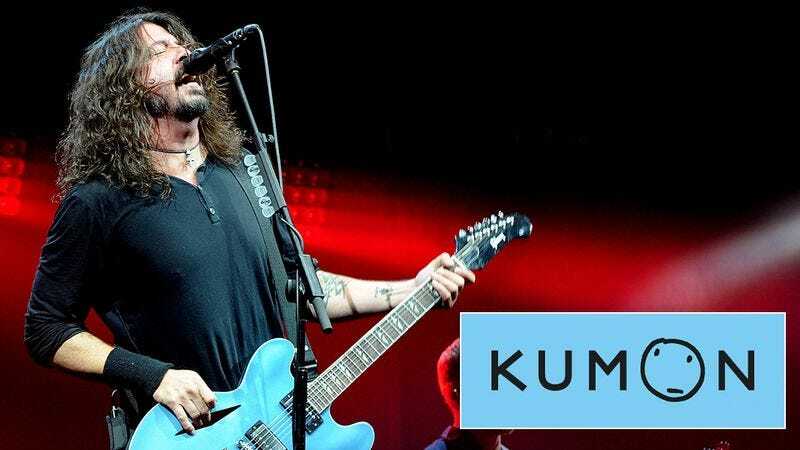 While Grohl’s parents are proud of his accomplishments as a musician, they put his education first, choosing Kumon’s short, incremental math exercises that are specifically tailored for the frontman’s success. With sessions beginning this week, Dave is being forced into an indefinite retirement to focus on his Kumon course work. Bummer. As Foo Fighter fans get reimbursed for the now canceled Austin, Phoenix, and Las Vegas shows, the former Nirvana drummer will be tutored by Sergei, a 25-year-old UCLA grad student who has been working for Kumon for the past two years. When Sergei says he’s ready, maybe Dave will return to music. But for now, the Foo Fighters will be put on hold as Dave heads to Kumon Tuesdays and Thursdays from 7 to 8 p.m., where he’ll be tutored with a variety of math worksheets in the traditional Kumon method. Sergei plays guitar, too, so hopefully the two can talk music whenever Dave gets frustrated with reducing fractions. But anyone hoping for a Grohl solo album to drop while he’s doing Kumon should readjust their expectations: The Grohls have a strict no-guitar policy for their son until he shows significant improvement. While fans have so far been supportive of Dave focusing his attention on nailing intro to algebra concepts, there is no doubt that there is a pall over the music world today. Farewell to one of the greatest bands to emerge from the post-grunge era.